This map includes 54 ccTLDs, each aligned over the country it represents. Each ccTLD is sized relative to the population of the country. The largest country is Nigeria, with more than 150 million people; the smallest type size used reflects those countries with 10 million or fewer residents. Also included are four Arabic-language domains for Algeria, Egypt, Tunisia, and Morocco. 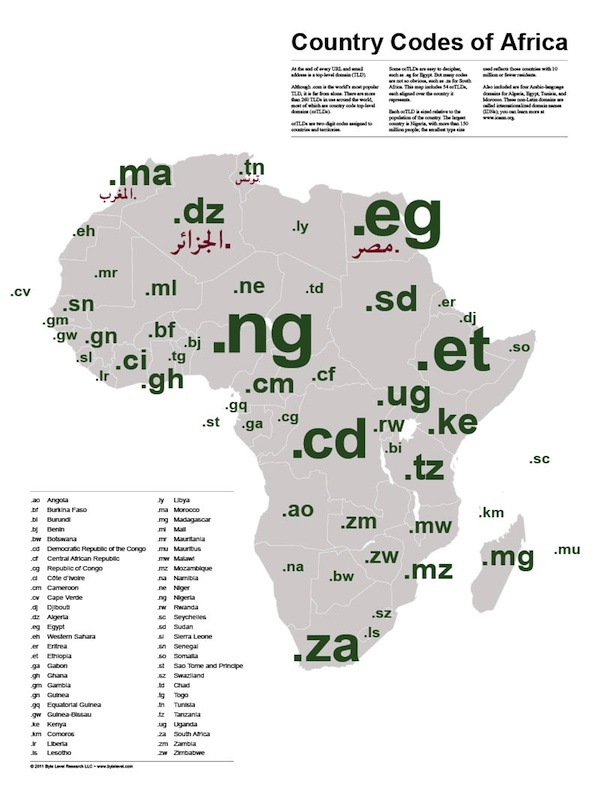 These non-Latin domains are called internationalized domain names (IDNs); you can learn more at www.icann.org. Each two-digit code is aligned over the country it represents and is sized relative to the population of the country or territory.